Our St Lucia turtle Tours are part of a rural community development project and the community in this area are among the most pro active local communities regarding conservation. The St Lucia turtle tours operate in an area which is known to have the highest population of nesting turtles along the South African coastline, the Maputaland Turtle Sanctuary, which makes our chances of sightings more of a guarantee than a chance, and, during the main part of the season, we offer 50% money back on all of our St Lucia Turtle tours if no turtles are seen. Our St Lucia Turtle Tours DO NOT INVOLVE DRIVING VEHICLES ON THE BEACH. If you come on one of our St Lucia turtle tours, you will be walking along a pristine beach. We are an extremely environmentally aware company and we believe that the use of any vehicle on a turtle nesting beach in an unnecessary disturbance to the nesting turtles. Our St Lucia Turtle Tours are done along North-East coast of South Africa is perfect habitat for a variety of species of sea turtles. The climate is hot, the ocean water is warm and crystal clear, and there are thousands of reefs which provide food and refuge for sea turtles and great sightings for visitors doing one of the St Lucia Turtle Tours. The coastline itself consists of hundreds of kilometers of unspoiled, undeveloped golden beaches, perfect nesting areas for turtles. A 300km section of coastline had been declared a World Heritage Site and is protected by UNESCO. 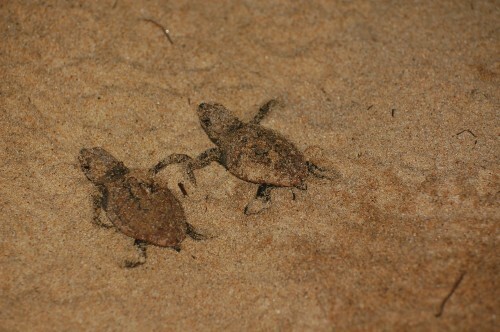 The area is now known as the iSimangaliso Wetlands Park (previously known as the St Lucia Wetlands Park), and was declared a World Heritage Site in 1999 and officially opened by Nelson Mandela, so when doing St Lucia turtle tours, you get to see not only the giant sea turtles, but also the untouched landscapes. Within the iSimangaliso Wetlands Park, just South of the Mozambique border, there is a section of coastline about 100 km long where there is an extremely high concentration of nesting turtles during the summer months from November to February. This area is know as the Maputaland Turtle Sanctuary and falls within the St Lucia Marine Sanctuary and where St Lucia Turtle Tours operate. Access to the turtle sanctuary is strictly controlled and only small areas of beach area accessible to the public. Turtle tours at St Lucia are strictly controlled; the local community, the Thonga tribe, participates in the protection of the turtles by being involved in law enforcement, research, monitoring and turtle tours. International tourists visiting South Africa do turtle tours in the area which are run by members of the local community. The St Lucia turtle tours generate revenue for the community not just through turtle tours, but also through accommodation at Bhanga Nek, and other activities in the Bhanga Nek area, including hiking trails and bird watching. Involving local communities in conservation of the fauna and flora is essential, enabling people to benefit financially by utilizing the available resources in a sustainable way. Community based projects such as the St Lucia turtle tours are beneficial to the community because they earn revenue, beneficial to the tourists who want to do turtle tours at St Lucia and see turtles, and beneficial to the turtles because they are protected in the process. If you are going to be visiting South Africa and the St Lucia area and you want to do a turtle tour and see loggerhead turtles and Leatherback turtles, ensure that the turtle tour which you do is community run. Also ensure that you book your St Lucia turtle tour in areas where many turtles nest, or else you probably will not see any. Comfortable shoes to walk along the beach in, camera, a light waterproof jacket, a warm jersey, a small rucksack or day pack or a turtle bag, turtle T shirt, a turtle hat, and a sense of adventure! For more information about our St Lucia turtle tours in South Africa, please contact one of our friendly team members who will only be too happy to assist you. In St Lucia, turtle tours are a popular activity for both international and South African tourists. The St Lucia area is the southern most range turtle nesting grounds in Southern Africa. From St Lucia, turtle tours take you up to Cape Vidal, or further up north to Kosi Bay and the Maputaland Turtle Sanctuary. The numbers of nesting turtles along the Maputaland coast does differ substantially from south to north. Traveling north of St Lucia, turtle numbers gradually increase until you reach the sanctuary. In the Maputaland turtle Sanctuary, turtle sightings, during the main part of the turtle nesting season [Dec-end Feb], are virtually guaranteed. The species of turtles which nest at St Lucia are the Loggerhead turtle and Leatherback turtle, both impressively large species. The Leatherback turtle being the largest reptile in the world, reaching up to 900kg. The smaller of the two species, the Loggerhead turtle, weighs an average of 150-300kg. Both these species of turtles do not nest only once in a season, but up to 10 times, with clutches of 70-100 eggs per nest. Considering the hatchlings have a survival rate of only 0.02%, the large numbers of eggs is essential for the survival of the species. The St Lucia turtle tours running up to the Maputaland Turtle Sanctuary are definitely the most productive and eco friendly of the turtle tour options available, as there is no driving on the beach, walking only. From St Lucia, turtle tours start from the beginning of November, and end at the end of March. 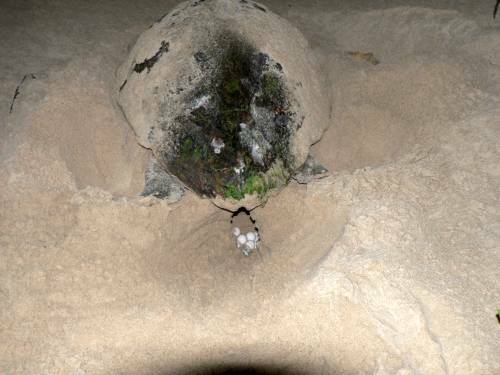 During the first half of the turtle nesting season, from November to mid January, the turtles lay their eggs and we watch the nesting process, then the remainder of the season is spent searching for the turtle hatchlings which are rushing down to the waters edge trying to avoid the numerous predators hunting them. We recommend that if you are in the St Lucia area wanting to do a turtle trip, do the distance and go up to the Turtle Sanctuary, you will be rewarded. 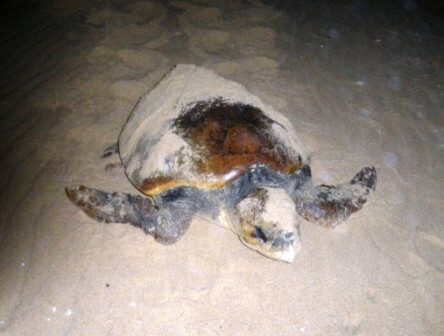 The first turtle nests have been seen 10km south of the Mozambique border which is about 200km north of St Lucia. Nesting. From mid October, turtles have also been nesting in the St Lucia Marine sanctuary, in the area between 9 Mile Point and Boteler Point. 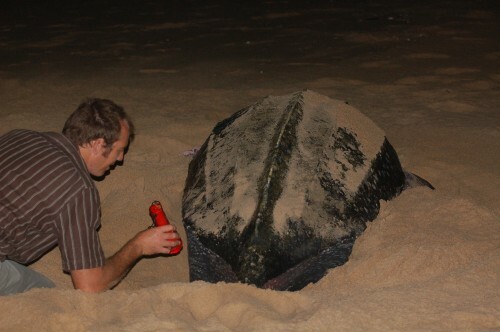 Both Leatherback and Loggerhead turtle nests have been seen. All St lucia turtle tour operators and turtle tour operators in the north of the iSimangaliso Wetlands Park are awaiting a go ahead from the iSimangaliso Wetlands Park Authority before this seasons turtle tours can begin. 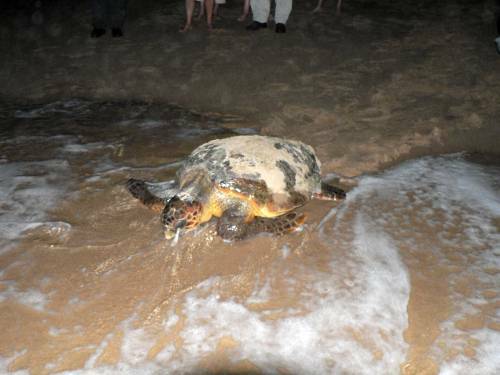 We will post regular pictures and news on this page as soon as the St Lucia turtle tours commence. St Lucia Turtle Tours by Extreme Nature Tours and Safaris. The iSimangaliso Wetland Park Authority have released the names of the Bhanga Nek turtle tour concession holders for the 2014 / 2015 turtle nesting season. Two turtle tour concessions were granted for the Kosi Bay and Bhanga Nek area. Turtles have started nesting and tours have started. Price - R895 per person, Departure from St Lucia at 14h00 and return at 02h00. The beaches of Maputaland are constantly changing because of the huge amount of sand shifted by long shore currents, especially during rough seas, and by extreme events such as cyclones which bring high storm surges which scour the beach and dune line. This turtle nesting season the beach at Bhanga Nek is turtle friendly with few vertical drop-offs and exposed rocky areas and with even gradients. This has resulted in high numbers of turtles using the Bhanga Nek beach. Last night we spotted 7 turtles and the tracks of 10 others. Already 3000 turtles have been recorded and it seems this population is still increasing. There have been no major storms or cyclones and the hatching success of turtle nests should be good this season. We have already seen many nests hatching and thousands of baby turtles have made it safely to the sea. There was some predation of nests by water mongoose and monitor lizards, but no poaching of turtles or eggs was reported or noticed this season. We are expecting a good 2015/2016 season beginning 1 November 2015.